Long Beach Accountability Action Group™ LAAG | www.LAAG.us | Long Beach, CA: What recession? As the article from the Wall Street Journal below so aptly noted its never a recession for government employees. Although the article picks in NY California is no different nor is any other state or local government entity. Heathcare and pensions get fatter. Their pensions cant ever really "loose value" in the market because if they do taxpayers bail them out. Their healthcare is gold plated for life. I am sure many federal employees voted against Obama not wanting to share their healthcare with the rest of us "little people". Hiring goes on unabated, raises (not for merit mind you) keep piling up year after year, fattening that pension. Oh and lets not forget that you cant ever be laid off or fired unless you basically want to be or shoot your boss. The point is there is no recession for government employees. Oh and remember they dont pay social security taxes. They are too good for that. Social Security is for "po' folk" pensions. So the next time you wonder how your neighbors are struggling in the recession dont ask your government employed neighbors (likely the ones with the newest SUV's in the driveway) I wonder why in Obama's 30 minute infomercial he never ran across a "middle class" government employee (or retired one) that was "struggling". If Obama really wants to fix things he will federalize every worker in the USA like the TSA did. What is ironic is many of the folks likely crying Obama was a "socialist" during the campaign were likely government employees (I can name two; one shoots Moose). 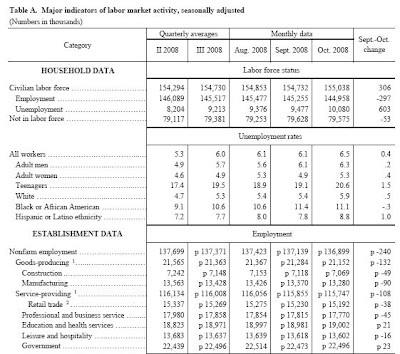 Take a look at these stats right from the Bureau of Labor Statistics (www.bls.gov) publication entitled: "THE EMPLOYMENT SITUATION: OCTOBER 2008"
New York spends as if the mortgage boom never ended. As the recession hits home, all across America businesses and families are having to make hard decisions about what not to buy this year, or whether they can afford a vacation or that plane trip home for the holidays. The exception is the government -- federal, state and city. As a case in point, consider the nearby chart as an addendum to our editorial last week on New York's imploding finances. City and state politicians want voters to believe that they have been careful stewards of taxpayer money, searching out waste far and wide, and genuinely doing everything they can to control government bloat. Ah, no. New York City did witness a reduction in public employment in 2002 and 2003, during the last period of slower economic growth. But the city quickly resumed its habit of ever-growing payrolls, and they have kept growing rapidly in the years since -- to an estimated record this June 30 of 313,965 employees on the public dime, according to the Mayor's office. That's an increase of more than 40,000 public workers in a year when Wall Street has been enduring historic losses and laying off tens of thousands of people. Like most of his predecessors, Mayor Michael Bloomberg has been reluctant to challenge the public-employee unions that drive ever-larger public employment. Now, amid the current downturn, he is once again talking about a property-tax increase or a new commuter tax along with some modest reductions in services. That is merely tinkering with the status quo rather than using the current crisis as an opportunity to drive major reform. As Rahm Emanuel likes to say, a crisis is a terrible thing to waste.